PMML (Predictive Model Markup Language) is the de facto standard used to represent and share predictive analytic solutions between applications. It enables data mining scientists and users alike to easily build, visualize, and deploy their solutions using different platforms and systems. PMML is the brain child of the DMG (Data Mining Group), an independent, vendor led consortium that develops data mining standards. Besides developing PMML, another DMG goal is to make learning material and PMML tools available to the data mining community. Last year, the first book about PMML was published. This book, entitled "PMML in Action: Unleashing the Power of Open Standards for Data Mining and Predictive Analytics", is now available for purchase on Amazon.com. 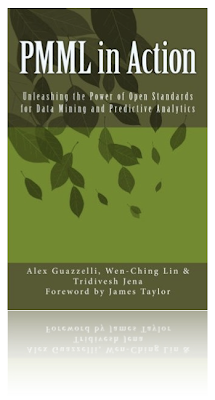 And so, as part of the DMG's continuing commitment to the success and adoption of the PMML standard, it is our pleasure to announce today the availability of a PMML tool, companion to the book: "PMML in Action", that provides an interactive, hands-on approach to the generation of data transformations. To access the tool, simply click HERE (or click on the "Transformations Generator" link available on the DMG website). PMML provides a variety of data transformations, including value mapping, normalization, and discretization. It also offers several built-in functions as well as arithmetic and logical operators which can be combined to represent complex pre-processing steps. In here we show two of the available operations in the interactive PMML tool: "Value Mapping" and the "Generic Operation". 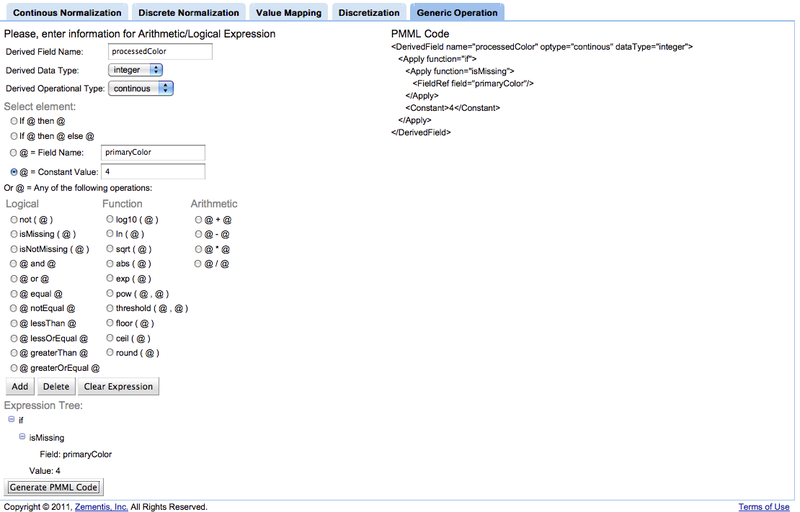 The figure below shows the "Value Mapping" transformation as represented by the transformations generator tool. The left side shows the graphical representation of the mapping of primary colors to numbers. The left side shows the corresponding PMML code generated by the tool. 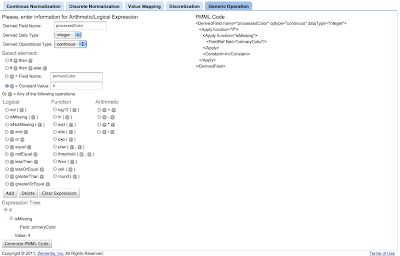 The right sides shows the interface together with the expression tree while the left side shows the respective PMML code. Start building your own transformations in PMML today! To access the transformations generator tool, simply click HERE.